Federal agents Ted Ingersoll and Ham Johnson are in Hobnob, Mississippi, when the river starts to flood--this is in 1927. Although their mission is to roust out bootleggers (you remember that this is Prohibition time, right? ), they become embroiled in saving a baby's life; finding someone to care for it; solving murders; finding hidden stills; and controlling their panic as the river rises and rises. The story is told in the voices of two protagonists: Ingersoll and Dixie Clay Holliver, the tough woman they leave the baby with. Franklin has a wonderful ear for language, and the particular cadence of Mississippi and the characters he and Fennelly (his co-author wife) evoke sound true to the time and location. The backdrop of the historic flood is fascinating as is the mystery. And it is not a bad thing that this is also a love story. I do hope this writing couple tries it again. 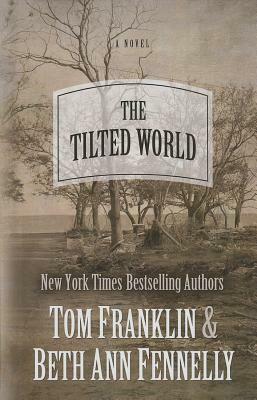 The Tilted World by Tom Franklin has descriptive copy which is not yet available from the Publisher.